UTMB 2017 – possibly the greatest long distance trail race in history!!! I first heard about the UTMB during my training for the Marathon des Sables. 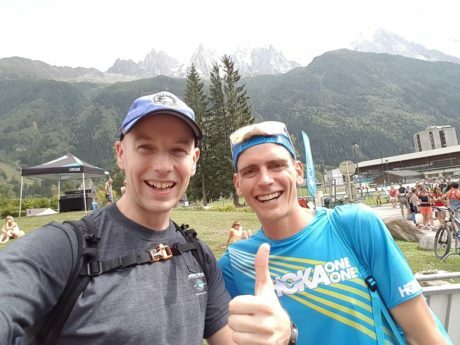 One of my tent mates had previously run this race and during the evenings in the desert he recounted stories of running through the mountains around Mont Blanc, the highest mountain in the Alps. It sounded fascinating and I figured that I’d look into it further after successful completion of the MdS. 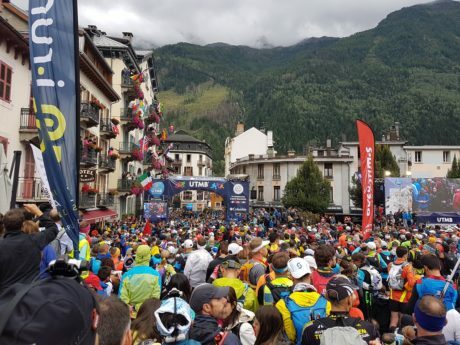 The UTMB has been going for 15 years and now, but it’s already one of the best known ultra marathons in the world. It is a single-stage mountain race and follows the popular walking route of the Tour du Mont Blanc through France, Italy and Switzerland. This route is considered to be one of the classic long-distance hiking trails and normally takes people over a week to complete. 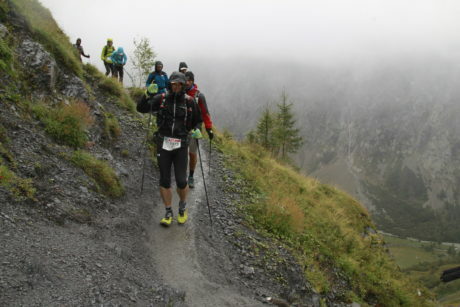 Whilst there are tougher races than the UTMB, it’s still widely regarded as one of the most difficult foot races in the world given the distance, elevation gain / loss and 46.5hr cut-off. It’s also one of the largest with more than 2,500 starters in 2017. 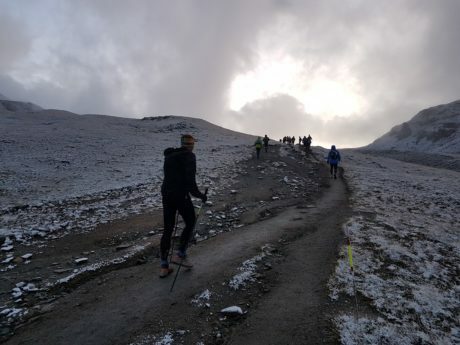 Entry to the race is pretty tough in the first place, as the race organisers want to ensure that participants are experienced enough to cope with the hardships of covering over 100 miles in the mountains. Due to the increasing popularity of the race, the bar keeps getting raised and you need to qualify by completing other mountainous or long distance races. For the 2017 race you needed 15 points from three races. There is plenty of information about how to qualify on the UTMB website, and in my case I was able to obtain the points through successful completion of the CCC, Cappadocia 110k, and MIUT, all of which carry 5 points each. I was pretty excited when I found out that I’d managed to get a place in the race, but I was over the moon when I found out who else would be racing in 2017. It turned out to the one of the most stacked lined-ups in ultra marathon history, with a number of former champions returning, alongside some very exciting contenders from the U.S. Most people expected Kilian Jornet to win, but he was up against some very tough competition from the likes of François D’haene, Jim Walmsley, and Xavier Thévenard. The very reason Kilian signed up in the first place was due to the level of competition and he knew it was going to be an exciting race. The actual route of the race can vary slightly from year to year, but it’s normally around 105 miles with close to 10,000m elevation gain. The route can be modified due to unpredictable weather conditions, which was the case this year! The race organisers very kindly added on some bonus miles whilst reducing the cut-off by half an hour, although we had a couple of hundred metres less ascent overall. The thing I love about these events is that everyone is treated equally. Even the pros have to queue up with the rest of us to get their kit checked and pick up their running numbers. I had the pleasure of queueing behind Tim Tollefson who had finished 3rd in the race last year and who finished 3rd again this year, shortly behind François and Kilian no less! He was a really friendly guy and we had a good laugh whilst we waited patiently in the queue. The start of the race itself was at 6:30pm on the Friday. It was very emotional and it felt like going into battle as Vangelis Conquest of Paradise played over the speakers. Many of the runners looked tense and nervous, whilst it was clear that Kilian was enjoying himself as he filmed much of the start on his phone. In fact, he also filmed the first 30 minutes of the race and was clearly having fun! Getting out of Chamonix was very slow as the streets were narrow and lined with thousands of spectators. Even as we hit the trails, the paths through the forests were still lined with supporters. It was a truly memorable experience and also quite surreal. The first 50 miles were a blur. We hit dense fog up the first mountain shortly before nightfall. Due to the heavy rain in the days preceding the event the trails were slippery and very muddy in places. My quads were trashed early on from the lengthy and demanding descents, and I managed to twist my knee and ankle as I slid in the mud. On top of this, the temperatures plummeted and there was snow. It helped knowing there were many competitors around me experiencing the same hardships. 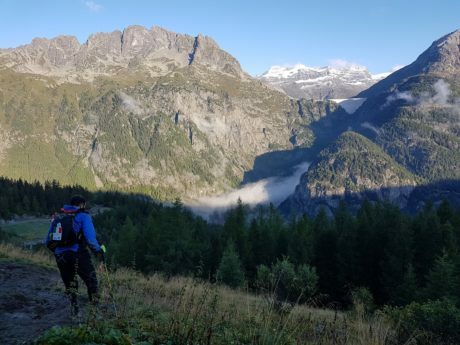 By the time we started approaching Courmayeur I’d lost my ability to run downhill due to tight legs and a painful knee, which I’d managed to get one of the medics to strap for me. However, my spirits were lifted as the sun came up and the temperatures rose. We were treated to some beautiful views along Lac Combal and the steep descent into Courmayeur didn’t seem so bad knowing that there would be hot food and a friendly face at the bottom of the mountain. The half way aid station at Courmayeur was a tad chaotic with queues for both the food and the toilet. I don’t normally mind queuing, but not when I’ve been on my feet for over 15 hours. Still, a new pair of trainers from my drop-bag eased the pain, and it was great chatting away with my friend Emily as I switched my kit around. After leaving Courmayeur the real challenge began. The weather became highly unpredictable and after leaving Refuge Bonatti the temperatures dropped, the winds picked up and snow started falling at a 45 degree angle. I was too slow in putting on my gloves and my hands were frozen solid. By the time I reached the next aid station at the bottom of the valley, there were many people huddled under the canvass trying to warm up, putting on as many layers as possible before heading out to the exposed climb up towards the Italian Swiss border. After finally descending into Switzerland the snow turned to heavy rain and my waterproofs were being fully tested. Thankfully all the equipment was holding together, which was more than could be said for my legs! One of the things that strikes me about these types of events is the amazing support and goodwill displayed throughout. After a tough climb through muddy forest paths towards Champex Lac, it would have been easy to feel dispirited. However I found a couple of tutu wearing British chaps sitting at the far side of the aid station being tended to by their family. After sitting down next to them, the family very kindly started to see if there was anything that I needed and I had a lovely chat with the Mum and Dad who had come to see their son compete in the event. They were kind enough to fetch me some drinks and keep an eye on my kit whilst I went foraging for food. It really helped lift my spirits again, despite knowing there were still three tough climbs to come. By this point the wet conditions and mud had played havoc with my feet and I could barely put any pressure on the right foot as I limped downhill into the Vallorcine aid station. A quick visit to the medics in the aid station and my foot was quickly strapped up and covered in Nok, an anti-chaffing cream. I think this was designed to prevent my skin from tearing. 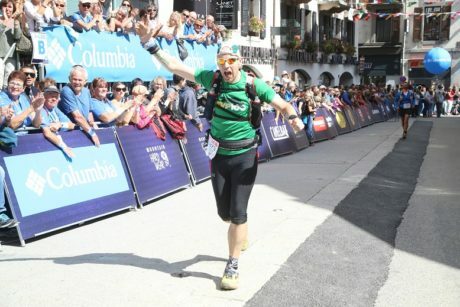 However my spirits had been lifted yet again by chatting to the friendly medics and the fact that I was approaching the final section into Chamonix. For some reason I thought we were going to run on trails that followed the side of the road into Chamonix. However, like many of the other runners, I was very confused when we started to climb into the mountains again and started following rocky paths with slippery tree routes, which made things very slow going. As we made it above the tree line I could see the final aid station in sight, so trudged slowly and painfully upwards whilst gritting my teeth. It was actually the downhill that I should have feared though, as we soon started descending a steep slope that lead back into the trees and started heading down towards Chamonix. By this point my knee, ankle and pretty much everything else was screaming with pain and the descent seemed to go on forever. It was only the thought of a comfy bed at the end that kept me going. The atmosphere entering Chamonix was truly electric. The sun was out, it was about an hour and a half before the race cut-off and the streets were lined with thousands of people who had come out to cheer on the runners who had been battling the trails for over 44 hours. The last 400 metres or so were incredible and it’s really one of the best finishes I’ve ever experienced in a race. Each and every runner is made to feel like a hero. Crossing that line was a real mixture of emotions. I thought that I might cry, but I was actually too exhausted to do anything. Instead I was very kindly helped out by some of the lovely ladies from Advent Running who had come out to cheer me on, in addition to my friend Steph who had completed the CCC the day before. The finishing area was chaotic but I really didn’t care by that point. I hobbled over to receive my finisher gilet only to be told they had round out of size medium and that I needed to wait 10 minutes whilst they made some more. I found a seat and waited…again, I didn’t care, I was just happy to be sitting down and to have made it. After obtaining the gilet I hobbled over to the drinks area where I picked up a cold can of Orangina. It was nice to be drinking something other than Coke, water or Tailwind! After picking up my dropbag I was kindly escorted back to my hotel. I fell through the door to my room, unpeeled my clothing and crawled into the bath. I started running a bath but I was battling to keep my eyes open. With the tub half full I managed to remove the majority of the mud and dirt and after drying off and climbing into bed I was asleep the very second my head touched the pillow. After three hours sleep I managed to hobble out for a pizza and then went to a party put on by Like the Wind where I had a celebratory pint or three. Would I do the UTMB again? I’m genuinely not sure. At the moment definitely not, but I’m sure I’ll forget the pain over the coming weeks and will be left with memories of an epic adventure and I’ll be wearing my finisher gilet with pride knowing that only ~66% of the competitors had made it to the end. I’m really glad to have been part of such a special race though and I can’t recommend it enough. What’s next? Well, I would love to have a crack at the Western States Endurance Run. This is another tough race to get into, but at least completing the UTMB is a qualifier, so I just have to be lucky with the ballot!